Puréed aromatic vegetables with lump crab meatin a delicately seasoned cream reduction. 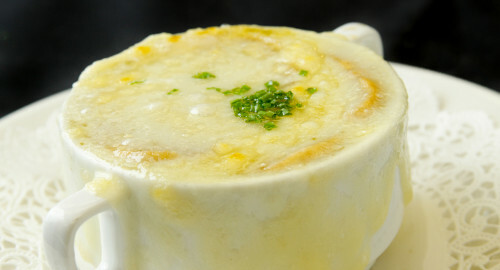 A traditional classic topped with gruyere cheese. Plump colossal ocean shrimp lightly breaded and rolled in freshly ground coconut, then lightly fried. Served with an orange ginger sauce. Two jumbo lump crab cakes served with lemon beurre blanc and pink peppercorns. Tender calamari lightly dusted with semolina flour and fried with fresh sliced fennel and red onion, served with our zesty remoulade sauce. 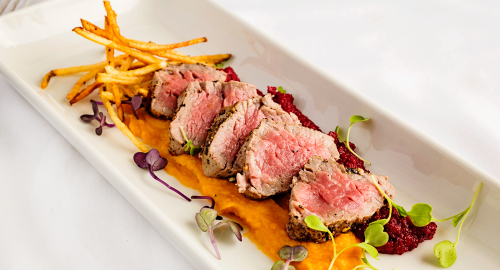 A steakhouse classic served with either our spicy cocktail sauce or our zesty remoulade sauce. Lightly crusted giant sea scallops wrapped in crispy apple smoked bacon with fresh mango salsa and a hint of chipotle honey sauce. Six large escargots sautéed in a herbed garlic butter, topped with asiago cheese. Six large chunks of lobster tail sautéed in a herbed garlic butter, topped with asiago cheese. A generous mix of romaine, spring greens, red pepper, tomatoes, Granny Smith apples, red onions, toasted almonds and dried cranberries. Served with our unique Big Bleu dressing. Chopped iceberg and romaine tossed with red onion, egg, bacon, diced tomatoes, bleu cheese crumbles, hearts of palm and artichokes in our special chop house creamy vinaigrette. A sliced Beefsteak tomato topped with Maytag Bleu Cheese crumbles and red onion served with herb vinaigrette on top of field greens. Full wedge of chilled iceberg lettuce topped with fresh diced tomatoes and bacon crumbles. With choice of dressing. Crisp romaine tossed with garlic croutons, our rich Caesar dressing and reggiano parmesan. Topped with shaved parmesan cheese. Anchovies available. A sliced Beefsteak tomato topped with fresh mozzarella on a bed of mixed greens and herb vinaigrette. 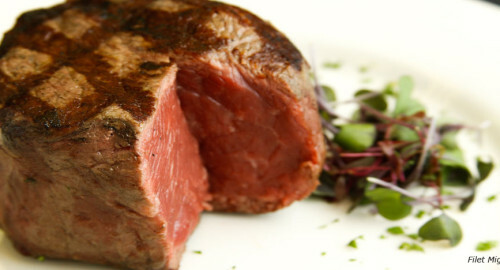 Mark's Prime Steakhouse is passionate in serving you the finest USDA inspected beef. We cook our steaks over a wood fired grill and serve them on a hot plate sizzling in butter. 7oz. portion of the leanest and most savory, tender cut of American beef. 16oz. An exquisite U.S.D.A. Prime Ribeye. A well-marbled taste celebration. A generous 11oz. full cut portion of this classic favorite. 16oz. Bone in Pork Chop bronzed in a light seasoning. A fabulous taste sensation with a side of chipotle honey sauce. 20oz. U.S.D.A. 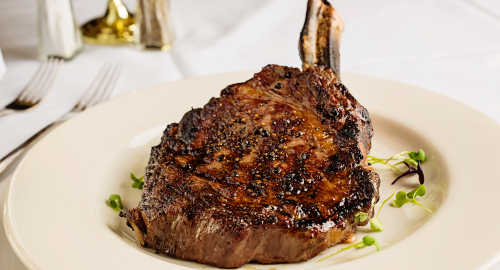 Frenched bone-in Prime cut for the ultimate steak experience. 14oz. U.S.D.A. Prime beef that has it all... firmer texture yet tender and full flavored. 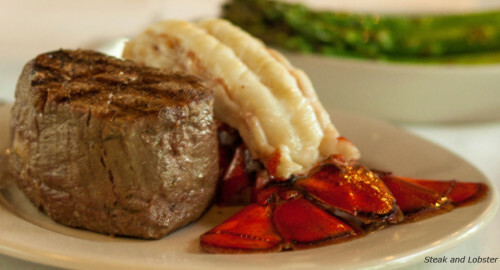 Petite Filet served with a cold water butter poached Lobster Tail. Market Fresh Fish specially prepared daily. Fresh grouper lightly bronzed, served with fresh mango salsa and topped with jumbo lump crab meat sautéed in cilantro-lime butter. North Atlantic salmon served with a dill beurre blanc. Two 8 oz. tails broiled, grilled or house favoritelightly breaded and fried. Wood grilled jumbo shrimp, scallops, cold water lobster tail and fresh fish served with our lemon buerre blanc. 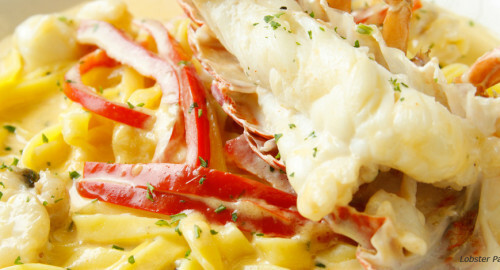 Fettucini tossed with sautéed tender lobster, served in a lobster cream sauce. 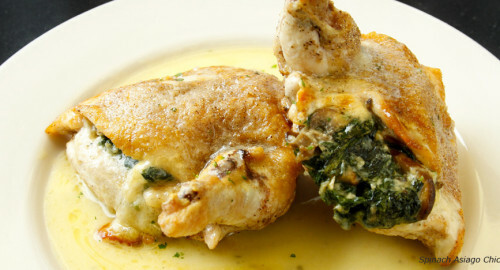 Fresh airline cut chicken breasts pan seared, stuffed and baked with fresh spinach, asiago cheese and crimini mushrooms. 10oz. fresh ground USDA Prime Beef with caramelized onions, apple smoked bacon and choice of cheese, served with french fries. Sauteed filet mignon tips in our brandy peppercorn sauce and served with mashed potatoes. Mashed and whipped Idaho potatoes. Pan roasted to a crispy finish in duck fat with caramelized onions. Baked, blended with boursin cheese and scallions topped with cheddar cheese, bacon crumbles then baked again. Serpentini Pasta and lobster chunks in a three cheese sauce, topped with a parmesan panko bread crumb topping. Crispy pan fried with rosemary and garlic butter. Rich chocolate mousse with Oreo Kahlua crust finished with Hazelnut cream, raspberry puree and toasted almonds. Classic Creole egg custard with fresh berries and mint. Bananas, walnuts, raisins and our house bread cooked with our rich rum custard and served with a Crown Royal Anglaise and caramel sauce. 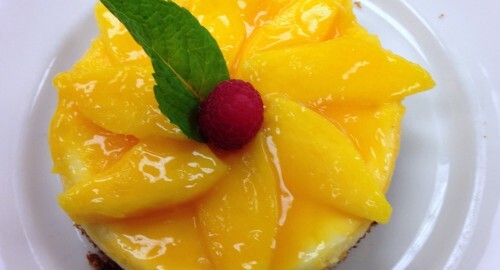 Chef's cheesecake of the day. Absolut Vodka infused with cucumber, watermelon vodka, and fresh basil. 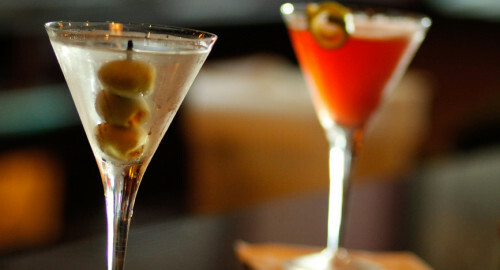 Chopin vodka, chilled, stirred not shaken served with gourmet olives. Knob Creek Bourbon, splash of sweet vermouth, garnished with luxardo cherries. Grey Goose Vodka, olive brine and a mist of dry vermouth. Crown Royal, sweet vermouth, muddled orange and luxardo cherries. Absolut Mandarin Vodka, champane, peach schanpps, orange juice and peach puree. Courvoisier VS Cognac, Cointreau liquor, fresh lime juice. Absolut Vodka infused with cucumber, Tanqueray Gin, and St. Germain. White Cream de Cacao, Creme Noyeaux served chilled and frothy. 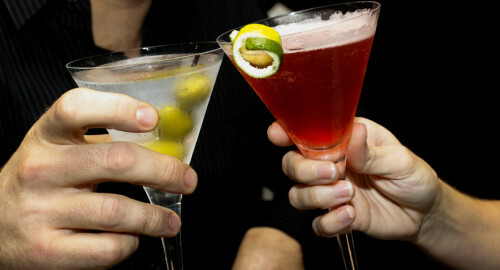 Belvedere Vodka, Grand Mariner, fresh lime juice, and a splash of cranberry juice. Espresso, Skyy Vodka, and Tia Maria.